Craving a spicy curry or the perfectly tandoori-fired naan? How about a sweet mango lassi to keep cool this summer? Los Angeles is a foodie’s paradise, and there are some top-ranked Indian restaurants you need to try. Start with India’s Restaurant at 4366 Fountain Ave. for an impressive lunch buffet and authentic dishes from around India, from the dosas of Southern India to the staple butter chicken in Northern India. Anarkali Indian Restaurant at 7013 Melrose Ave. is known for their chicken tikka masala with a laidback yet modern atmosphere. Available for delivery to your Lawndale hotel, this pan-Indian destination specializes in breads with a variety of stuffing choices, curry dishes from around India, and plenty of homemade sweets such as besan ladoo (sweet chickpea balls) and sweet lassi. Badmaash, located at 108 W 2nd St #104, changes what most people think of “Indian cuisine” to incorporate a modern twist. It specializes in street foods such as the unique “frankie rolls” and vada pav—a favorite of laborers that features a spicy potato filling in perfectly buttered rolls. Try the gooey grilled cheese stuffed with Amul cheese and tomato chutney, and you’ll never crave American grilled cheese again. Anar Indian Restaurant is located at 1807 N Cahuenga Blvd. and is known for homecooked comfort food, including dishes like saag paneer. 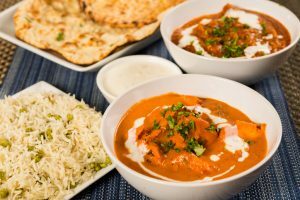 Specializing in Northern Indian cuisine while also offering plenty of options for vegetarians, you can expect decadent, creamy, and mildly spicy dishes here.